Picking the Frozen Four, and the two best teams in the country in the final. Last week, two teams that probably shouldn’t have ended up in the NCAA Tournament were on the cusp of making the Frozen Four. I picked both of them to get bounced in their opening game, so I was intrigued to see if they would prove me wrong and make it to Tampa. In the end, Ferris State and Minnesota-Duluth got eliminated in the regional final and I ended up picking three of the Frozen Four participants correctly. (One of these years I’m going to get all four.) Ferris was the team I was particularly focused on because I didn’t think they had a chance in hell of winning the WCHA Final Five. Thanks to the goaltending of Darren Smith, the Bulldogs managed to take out top-seeded Michigan Tech and last year’s winner, Minnesota State, on consecutive nights to earn the automatic bid. Ferris was placed in the West Regional against No. 1 seed St. Cloud State, where it caught the Huskies sleeping and outlasted them in overtime. After watching that happen on TV, I was perplexed. I had seen the Bulldogs play twice in person and they didn’t look sharp at all. Where was all this coming from? Confusing as it was, I was convinced Ferris would get exposed, and it came at the hands of Denver. Ferris kept it close, but the Pioneers plowed through the Bulldogs and fired six goals past Smith to move on to Tampa. The other Bulldogs squad’s fate had been determined the day before. Duluth visited Michigan’s Upper Peninsula back in January and frankly, the Dogs didn’t look anything like I expected. They were supposed to win the NCHC this season and be a lock for the Frozen Four, but ended up coming significantly short of that. Still, Duluth ended up getting an at-large spot in the NCAAs and upset defending champion Providence in double overtime out in Worcester (Mass.). However, Duluth fell behind Boston College 3-0 in the regional final and its rally in the third period came up short. So now the Eagles will be moving on to Florida where they won the national title in 2012. The other two regionals played out as expected. Quinnipiac rolled past RIT and shut down UMass Lowell to win the East and make their first FF since 2013. Down in Cincinnati, North Dakota crushed Northeastern (a team that somehow became a popular pick by national columnists), and contained Michigan’s top-ranked offense to make its third straight trip to the Frozen Four. So in the end, two NCHC rivals, a traditional Hockey East powerhouse, and a rising ECAC contender will get a second Spring Break and be heading to Florida. Just like last season, this weekend portends some compelling storylines. 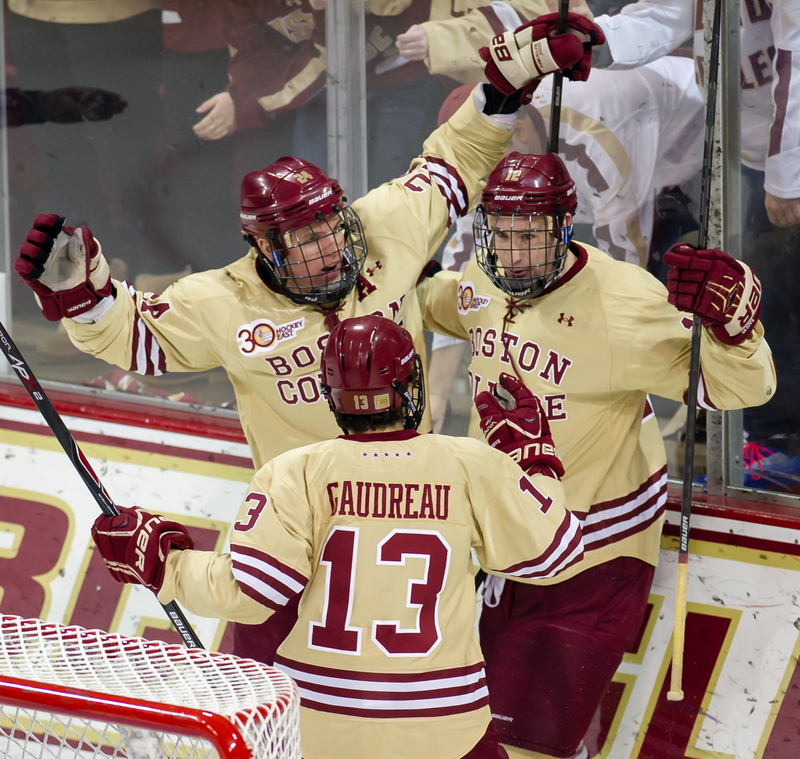 And then there were four: How Boston College will win its sixth NCAA title. There’s been quite a bit going on over the past two weeks since the NCAA Regionals, most of the big stories being players leaving school early for the NHL. Two stories stand out above the rest. The first is that longtime Colorado College head coach Scott Owens resigned. Owens has been at the helm since taking over for Don Lucia in 1999. During that span, the Tigers made the Frozen Four in 2005 on top of six other NCAA appearances. No reason was given for his resignation, but my theory is that maybe the powers that be wanted to move in a different direction, like Denver was last year with George Gwozdecky. The Tigers haven’t made the NCAA tournament in three years and just went through their worst season in 20 years. Whatever the reason, it’s a sad day because Owens is a talented coach who kept a small school competitive on a national stage. I’m sure he’ll be missed by the Tiger faithful. The other is that NCAA seems willing to reconsider its idea to stage the Regionals at neutral sites. On paper it seemed like a sound plan; it isn’t fair for one team to have a distinct home-ice advantage over the other teams in the region. The plan backfired because attendance at the Regionals has been terrible. Attendance turned around a little this year, but it’s still bad. A total of 8,893 fans for a regional championship between Minnesota and St. Cloud State sounds fine — except that the game was in St. Paul at the Xcel Energy Center, which holds more than twice that number (18,568). If the NCAA is smart, they will return the games to campus sites. Yes, it gives one team an advantage, but a good team overcomes that. I’ve seen it happen. Miami beat Minnesota-Duluth in 2009 in front of a loud, very partisan crowd at Mariucci Arena. (How partisan was the crowd? I was cheering for both teams and when the Redhawks scored first, I cheered and pumped my fist. I was the only one in the arena to do so outside of the Miami pep band. It was weird). Both of those stories pale in comparison to the Frozen Four, which starts Thursday. This year features three powerhouse progams and one on the rise. I got three out of the four teams correct with my predictions two weeks ago, which was my best performance in the Regionals so far. Let’s see if I can keep my luck going. Tampa Bay Times Forum, Tampa, Fla.
Thursday: Ferris State (25-11-5) vs. Union (26-7-7), 3:30 p.m.; Minnesota (28-13-1) vs. Boston College (31-10-1), 7 p.m.
Saturday: National Championship Game, 6 p.m.
One team will add to its trophy case. Who will it be? I kind of missed the boat in getting my NCAA hockey tournament predictions out last week so I thought I’d try to save face this week and give my prediction on who will hoist the National Championship trophy in Tampa Saturday night. This year’s Frozen Four is interesting, to say the least. Some have called it boring. Others have even compared it to this year’s Final Four in basketball calling both the most “dislikable four teams in America.” That’s a fair assessment of the basketball teams, but the casual fan has plenty of reasons to cheer for at least two of this year’s Frozen Four teams. On college hockey’s best rivalry, and the NHL’s best team. As a major college hockey fan, I’ve seen some pretty impressive rivalries – North Dakota-Minnesota and Denver-Colorado College – up close. The one rivalry people can’t stop talking about is the Beanpot rivalry in Boston. For those who are unfamiliar, the Beanpot is a unique tournament held on consecutive Monday nights every February between the four college teams in Boston: Boston University, Boston College, Harvard, and Northeastern. The winning team not only gets bragging rights over its rivals, it hoists the coveted Beanpot trophy in front of a sold-out crowd. BU and BC typically dominate, having won 46 of the 60 tournaments (BU, 29; BC, 17). Harvard has won the Beanpot 10 times, most recently in 1993, while perennial underdog Northeastern has won four – none since 1988.